Day two of the January 2010 Prop. 8 trial, marriage equality’s truth commission, continued testimony by Professor Nancy Cott. Jonathan Trumbull Professor of American History at Harvard University and author of of the book Public Vows: A History of Marriage and the Nation, Professor Cott testified about the history of marriage in the United States. 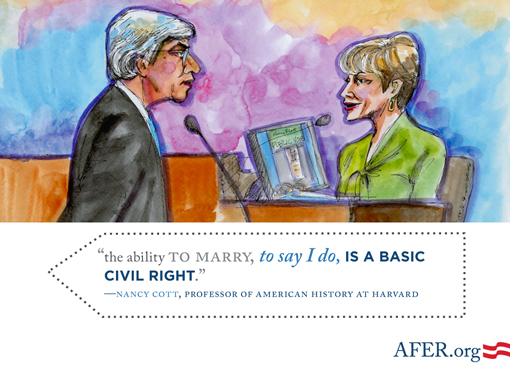 Her testimony explained marriage as a secular, public institution that has evolved throughout American history. Professor Cott’s testimony was recreated by Yeardley Smith at the “8″ Los Angeles premiere. 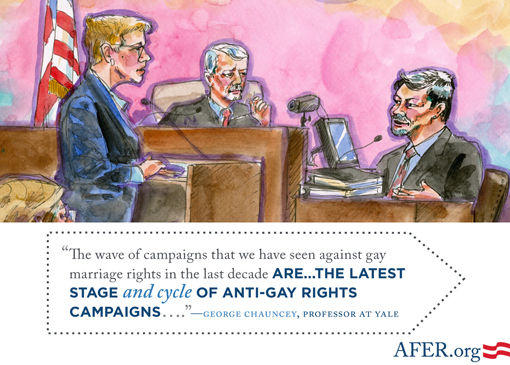 Then, Yale history professor George Chauncey testified about the history of discrimination faced by gay and lesbian Americans. His expertise was important to demonstrate a pattern of discrimination of gay and lesbian community.